Thanksgiving is less than 3 weeks away. Whether you're hosting or attending as a guest (I'm doing both) if you start preparing now, you'll have even more to be grateful for on the holiday. What can you do 3 weeks in advance? Let's start with the non-food portion: decor (as the host) and gifts (as the guest). Decor: determine a color scheme and a general theme for your tablescape. Try to incorporate items you already own so you only need to buy a few finishing touches. If you need inspiration, House Beautiful just rounded up 10 super talented bloggers to lend their holiday decorating advice. My favorite is Jacin Fitzgerald of Lovely Little Details' french striped napkins and cinnamon stick place cards - I love an atmosphere that is festive but not fussy. Plus as she mentioned, the cinnamon sticks double as drink stirrers - beautiful and useful. Perfection. If you're crafty and have the time, here is a great metallic leaves DIY project from Oh Happy Day. Gifts: I think any of these coaster sets or champagne coupe glasses would be a great hostess gift, as well as the items from West Elm Local's "Meet the Makers" event. If you need more options, Camille Styles recently rounded up a list of 10 Best: Hostess Gifts. I completely agree with her on this Studiopatró "Piece of Cake" Tea Towel, which I have hanging in my kitchen. Now let's move onto menu prep. Once you've sketched out a rough menu, the first thing you should do (yes, now) is stock up on the non-perishables. If you get this out of the way, you'll have a lot less to worry about the week of. My favorite: the wine! When trying to choose wine for our upcoming "Friendsgiving" dinner (it's tough for me to determine what pairs well with turkey when I don't eat it myself) I came across this "How to Choose Wine" infographic from Wine Folly that I think is really fun. I love "Feeling fancy?" "Oui!" (Always). 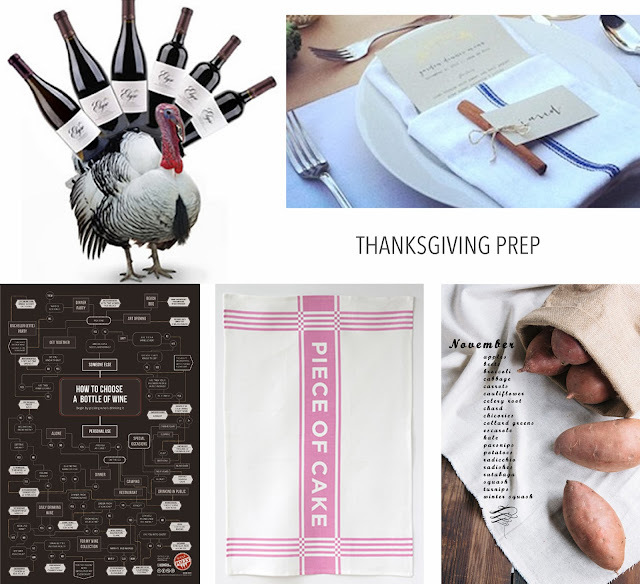 If you are feeling fancy, one of my favorite Napa wineries, Elyse Winery, is offering an assortment of 6 of their wines handpicked for a Thanksgiving celebration for $199 + $1 shipping (click the purchase tab to view the selection). The bottles include the perfect transition from chardonnay to port. If you're looking for something a little more affordable, Domaine Brunet Pinot Noir, a "French table wine" is my go-to ~$10 bottle. It pairs well with food (even when "dinner" is chocolate chips - you know you've been there) and it's a crowd-pleasing red. Regarding the dishes themselves, every food magazine out there has Thanksgiving menu suggestions, and everyone has their own family traditions, so we're not going to get into specific dishes here. Let's stick to preparation strategy. Food52 suggests 5 items you should stock your pantry with this month. You know I love pantry prep. Obviously the pumpkin puree is a must, and I would also add vegetable (or chicken) stock. They also have an incredible preparation guide, called "How to hike a mountain and serve Thanksgiving dinner on the same day." I think it's really smart that they touch upon what to eat the week leading up to Thanksgiving, because you still need to exist in the meantime! (A lesson that I already learned this week, when we opened a bottle of wine from our Friendsgiving stash... Whoopsie). If you need some help with November meals in general, Vintage Mixer's Seasonal Produce Guide highlights which vegetables are in peak season this month, and offers recipes to use them in. Plus, it's really pretty. I'd love to hear about your Thanksgiving preparations in the weeks to come!